In this Jan. 7, 2009 file photo, Then-President George W. Bush, center, poses with President-elect Barack Obama, and former presidents, from left, George H.W. Bush, left, Bill Clinton and Jimmy Carter, right, in the Oval Office of the White House in Washington. All five living former U.S. presidents will be attending a concert Saturday night, Oct. 21, 2017, in a Texas college town, raising money for relief efforts from Hurricane Harvey, Irma and Maria’s devastation in Texas, Florida, Puerto Rico and the U.S. Virgin Islands. AUSTIN, Texas — All five living former U.S. presidents will be attending a concert Saturday night in a Texas college town, raising money for relief efforts from Hurricane Harvey, Irma and Maria’s devastation in Texas, Florida, Puerto Rico and the U.S. Virgin Islands. 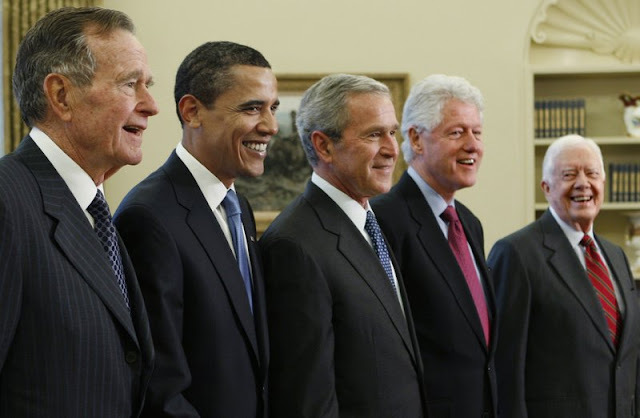 Democrats Barack Obama, Bill Clinton and Jimmy Carter and Republicans George H.W. and George W. Bush are putting aside politics in contrast with President Donald Trump, who has vowed to help Texas and Florida for as long as it takes but has criticized Puerto Rican leaders while suggesting aid there won’t be unlimited. Having so much ex-presidential power in one place is unusual. George H.W. Bush spokesman Jim McGrath said all five of Saturday night’s attendees haven’t been together since the opening of the George W. Bush Presidential Library in Dallas in 2013, when Obama was still in office. He didn’t answer a question about whether Trump was formally invited. The concert features the country music band Alabama, Rock & Roll Hall of Famer ‘Soul Man’ Sam Moore, gospel legend Yolanda Adams and Texas musicians Lyle Lovett and Robert Earl Keen. It’s happening at Texas A&M University’s Reed Arena in College Station, home to the presidential library of the elder Bush. At 93, he has a form of Parkinson’s disease and uses a motorized scooter or a wheelchair for mobility, though he participated in the coin flip at February’s Super Bowl in his hometown of Houston. George W. Bush was Texas governor before leaving for the White House and now lives in Dallas. There is precedent for former presidents joining forces for post-disaster fundraising. George H.W. Bush and Bill Clinton raised money together after the 2004 South Asia tsunami and Hurricane Katrina the next year. Clinton and George W. Bush combined to seek donations after Haiti’s 2011 earthquake. Amid criticism that his administration was initially slow to aid storm-ravaged Puerto Rico, Trump accused island leaders of “poor leadership,” and later tweeted that, “Electric and all infrastructure was disaster before hurricanes” while saying that Federal Emergency Management Agency, first-responders and military personnel wouldn’t be able to stay there forever. A website accepting donations, OneAmericaAppeal.org, was created with 100 percent of proceeds pledged to hurricane relief. Hurricane Irma subsequently hit Florida and Hurricane Maria battered Puerto Rico, while both affected the U.S. Virgin Islands. Organizers expanded the fundraising campaign to help those storm victims, too. All five living former U.S. presidents will be attending a concert Saturday night in a Texas college town, raising money for relief efforts from Hurricane Harvey, Irma and Maria’s devastation in Texas, Florida, Puerto Rico and the U.S. Virgin Islands.